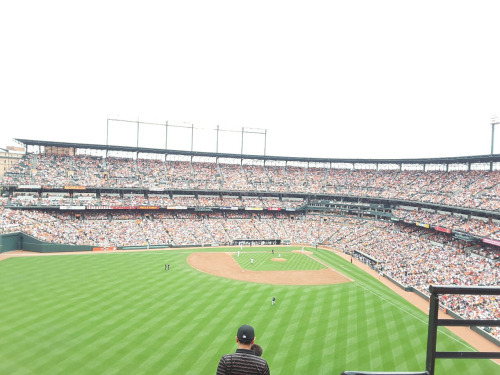 Today was the first time for me to watch a baseball game live in Baltimore. While up until now I have yet to grasp the basics and am still having a hard time trying to read the scoreboard, one thing I do understand is that a 5-years-old somewhere in this nation might already start his first game. This is the nation of baseball, and once again, I am reminded of the power of a single sport. Sports always find its way to bring people together and overcome social boundaries. A single baseball game in America can bring a wide range of spectators, in terms of age, races, and social backgrounds. Baseball brings people in this nation to have a great time while cheering on their favourite team together. You can never be too young, too old, too black, too white, or too Asian to watch or play a football game. It is basically everyone’s game! I can see that baseball to Americans is like soccer to Indonesians. Both holds the title of favourite sports in their respective nations, and have the potential to bring their people together. In some cases, these kinds of culturally-attached sports can even hold the power to lessen the level of potential conflicts. In Maluku, Indonesia, for example, there had been a clash between religious groups that started in late 1990s. The conflict had manifested in many violent acts between the groups, and government’s effort by remodeling the laws did not have any special impact. The interesting part is that though formal approaches did not work well enough, the number of violence acts decreased significantly in between 2005-2009. A journalist was interested in this phenomenon and held an etnographical research to find out the cause of this temporary peace. He then found that it is all rooted back to the region’s number one sport, soccer. The different religious groups are united by their high interest and strong will to bring the regional soccer team into success. Soccer was highly successful in making people in Maluku overcome their cultural differences. That is the power every sport holds.